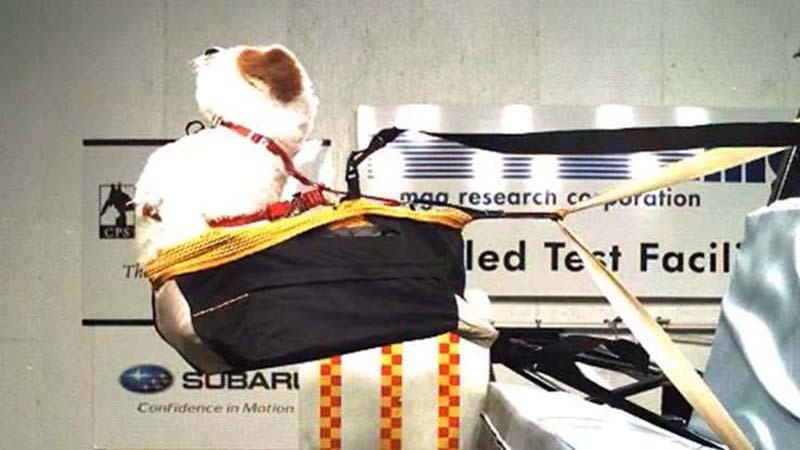 Recently, Subaru teamed up with the Center for Pet Safety to determine the safest locations for pets to be transported in a three-row crossover, since the company was just about to launch the three-row Ascent, and Subaru has worked to associate itself with pets and pet owners. But not everyone owns a three-row SUV, so we as pet lovers wanted to get some broader information about safely transporting dogs and cats in cars. To do so, we called up Lindsey Wolko, the founder of the Center for Pet Safety. Here's what we learned. There are a few reasons for this. Among them is simply that pets are less distracting in the back seat. They can't climb into your lap, and you aren't distracted petting them. Cutting down on this distraction reduces the chance of a crash and keeps you and them safe. Besides that, Wolko tells us that having them in the front seat is a danger because air bags are not designed with pets in mind, and they could injure your pet in a crash. There's also a strong risk of them being thrown from the car when up front. When deciding where your pets should be in the back, Wolko said it mainly depends on where they fit. If the back seat has captain's chairs, only smaller pets such as cats and small dogs should be placed there. Larger pets such as big dogs should mainly be on bench seats. 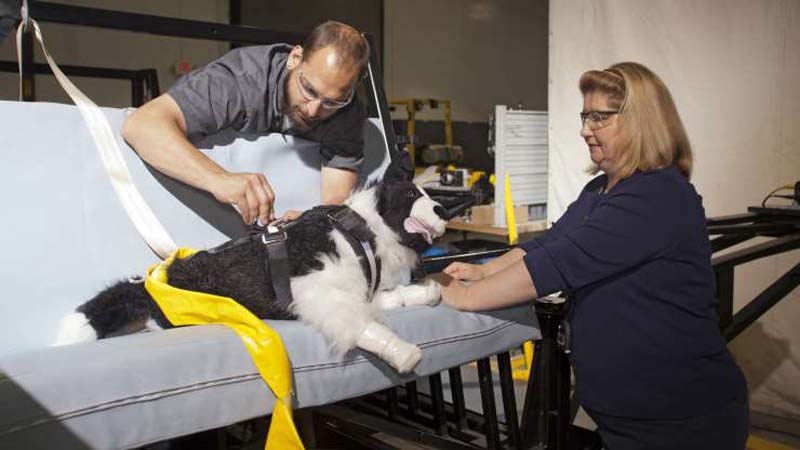 Another important aspect for pet seating is whether there's a strong attachment designed for restraint in a collision, and that's because of the next important thing to keep in mind. Your pets should be restrained for basically the same reasons we humans should be restrained. If a pet isn't restrained in a crash, it can fly forward and suffer severe injuries. It could even potentially hurt you if you're in the path of the pet. And if your pet doesn't collide with an object in the car, it could potentially be thrown from the car. There's also the possibility that in the aftermath of the crash, if doors and windows are broken and open, an unrestrained pet could run off and become lost. Even if the pet isn't seriously hurt from an impact, Wolko noted that some pets have suffered other injuries such as torn ACLs from trying to stay standing during a hard stop or crash. For all these reasons, you should really keep your pet in place in the vehicle. To do so, there are two key types of restraint Wolko and Center for Pet Safety recommend. The first kind is the carrier or crate type. You've surely seen these at pet stores, airports and many other places. 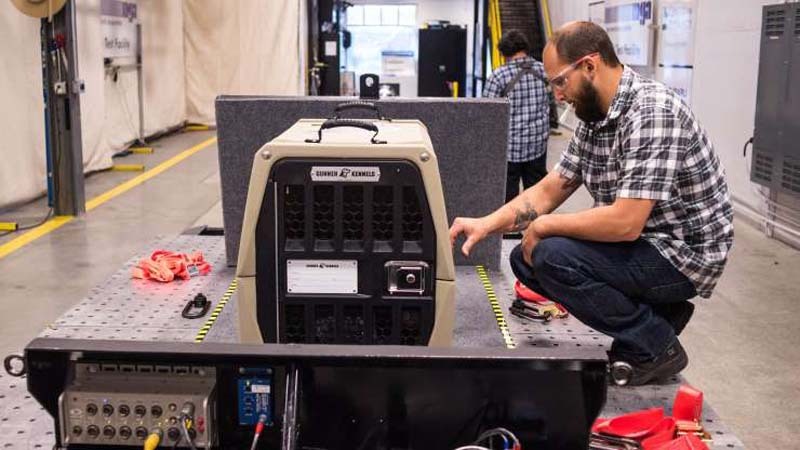 Though not necessarily the softest thing in a crash, a crate will keep your pet from being thrown out or having a hard, high-speed collision with parts of the interior. The crate or carrier needs to be securely attached in the car to attachment points that will withstand a collision. The other key type of recommended crash protection are harnesses and seats. These strap onto your dog and are attached to secure points such as the seatbelts. Basically they're seatbelts for pets. They should not be used in conjunction with ziplines or long extensions because this can negate the protection of keeping the pet in place. Another type of restraint is the barrier. These don't offer as much protection, though they are effective for preventing distraction. Only barriers that are securely attached in the car—and ideally designed for that specific car—should be used. Generic barriers that fit in place because of tension bars likely won't be strong enough to keep a pet contained in a crash, and that type of barrier could itself become a projectile if it breaks loose. Between carriers and harnesses, Wolko said it all depends on what your pet is more comfortable with. If your dog or cat constantly squirms and hates a harness, then some type of crate is probably the way to go. Conversely, if your pet doesn't like being placed in a separate compartment, it would probably prefer some sort of harness. As far as choosing safety equipment that's crash-rated, that's more difficult. 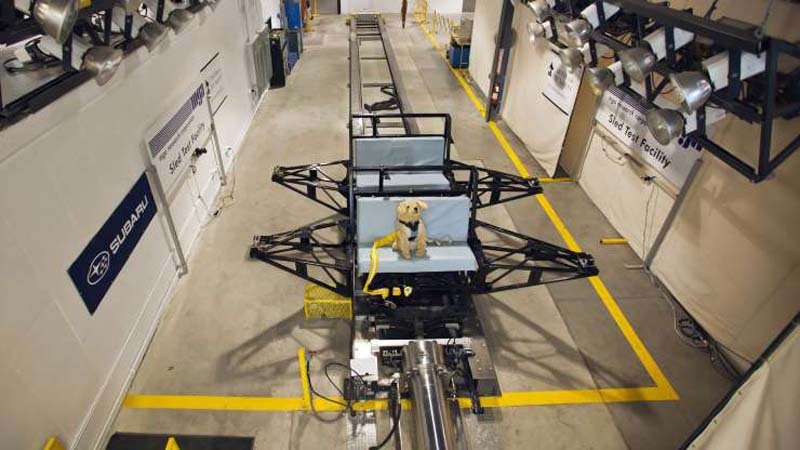 Wolko cautions against blindly believing marketing about crash testing. She recommends going with a product that has been tested by the Center for Pet Safety. She explained that CPS works with a third party to test products using a car-seat sled. 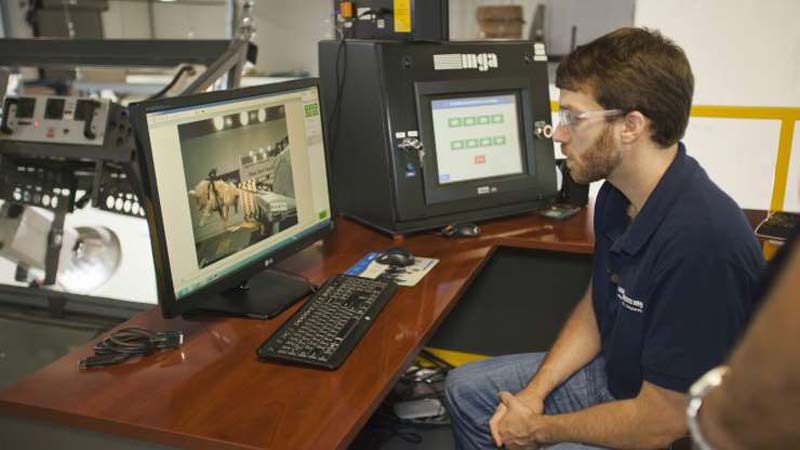 The organization also analyzes the construction of restraints to ensure quality and that they use safe designs. Products that are certified by the Center for Pet Safety can display the organization's seal of approval. The complete list is also viewable at the organization's website. The list is fairly short at the time of writing. Sleepypod harnesses and the ZuGoPet Rocketeer Pack are the only harnesses listed, and Gunner kennels, Gen7Pets carriers, and Sleepypod carriers are the only crates and carriers listed.